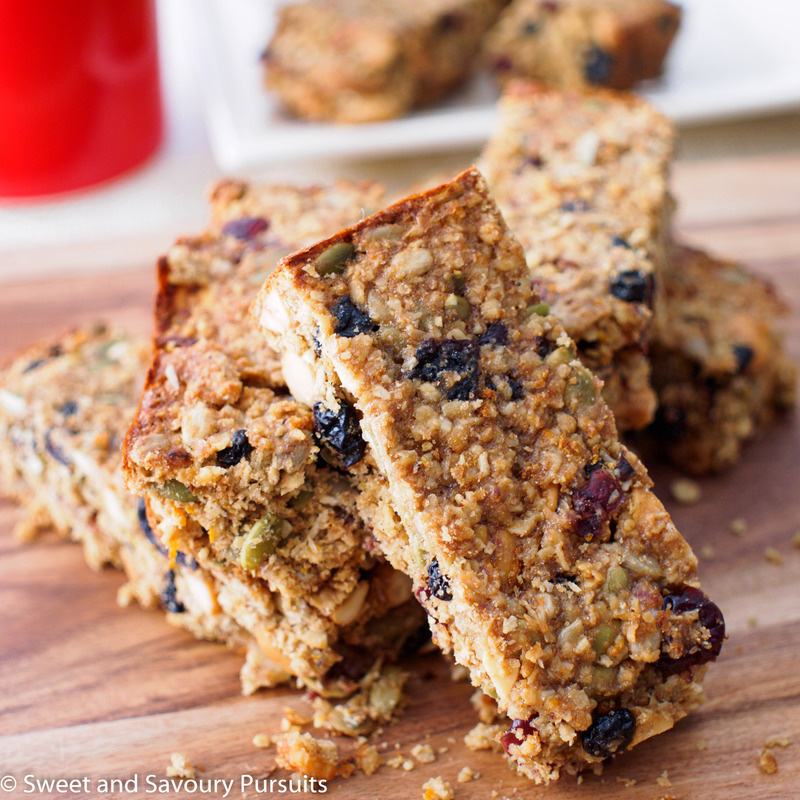 Made with whole grains, dried fruit, nuts and seeds, these delicious Cakey Oat, Fruit and Seed Bars make a great breakfast or snack on the go. My weekday mornings are usually so rushed that I rarely have time for a sit down breakfast. I usually pack one to go, usually boiled eggs, fruit or granola and yogurt. Problem is that by the time I’ve dropped the kids off at school and get to the office I’m super hungry. Not so easy eating granola and yogurt while driving! No worries, I’ve never actually attempted it, I know my limits! So I like to grab something I can eat on the go, but really dislike eating dry granola bars filled with sugar and not so good for you ingredients. So this weekend, I decided to make a version of granola bars that would be made with wholesome ingredients. Luckily, I had a well stocked pantry so I was able to find a good variety of dried fruit, seeds and plenty of nuts to choose from. I ended up choosing cashew nuts, pumpkin and sunflower seeds, and dried coconut, blueberries and cranberries. Knowing that hard granola bars is not my thing and that fluffy muffins and cakes are more to my liking, I knew that I would need a bit of whole wheat flour and some oats. I also grabbed some orange juice so that I can plump up the dried fruit making them moist and infusing them with a refreshing citrus flavour. The result was a somewhat cakey granola bar. 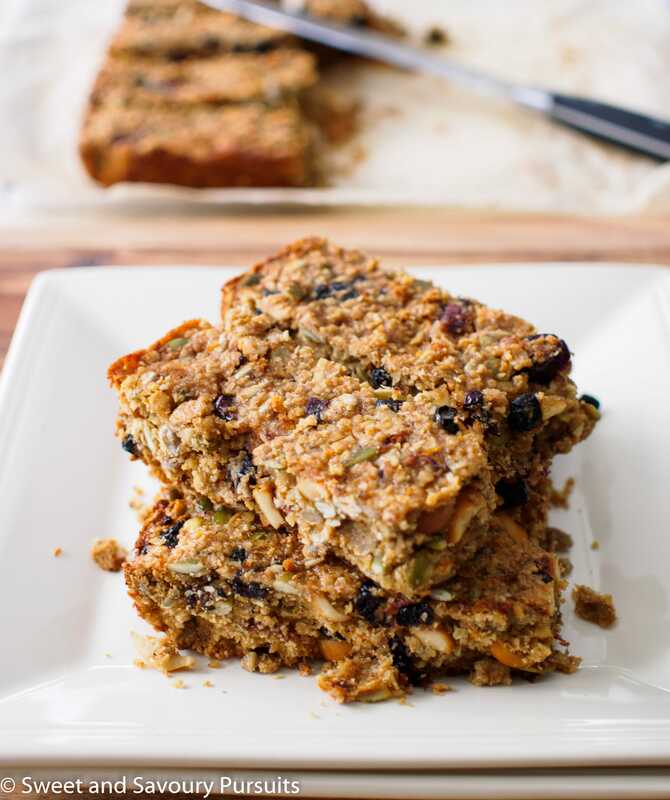 The bars are moist and chewy and dense with fruit, nuts and seeds. 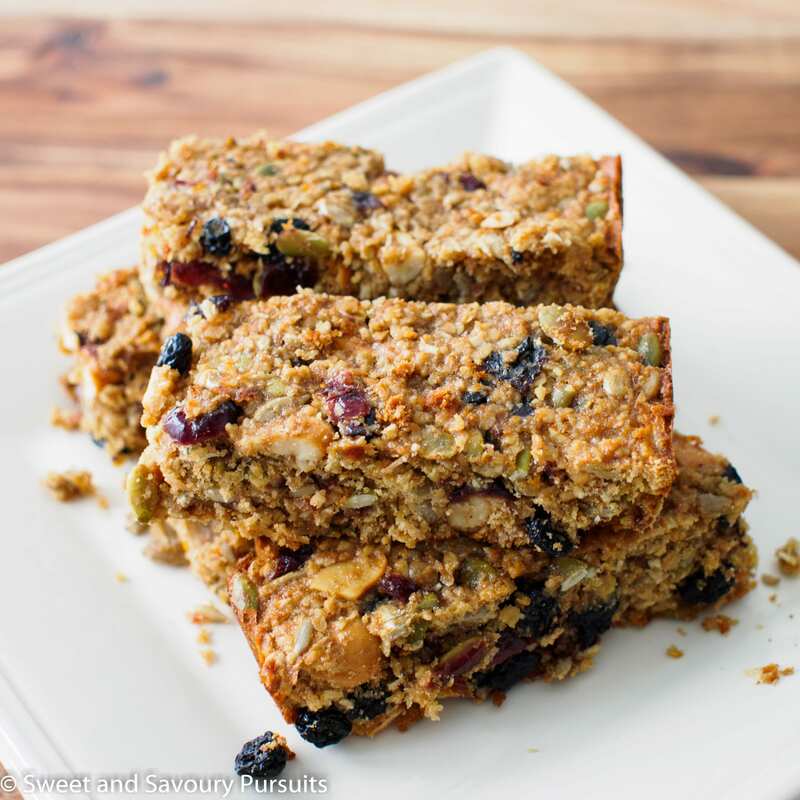 The oats and fruit helped make them chewy while the cashews and seeds gave the bars some added crunchiness. The bars are filling and simple to make. You don’t have to follow this recipe exactly, you can easily vary the dried fruit and substitute the cashews for another nut. The bars can be individually wrapped so they are portable for a quick and easy breakfast on the go or an afternoon energy-boosting snack. What type of breakfast do you usually like to eat on the go? For another great portable breakfast, take a look at my Whole Wheat Apricot and Almond Bars. Place a rack in the centre of your oven and preheat oven to 325ºF. Line a 9×9-in baking pan with parchment paper and lightly butter the paper. In a small saucepan, bring the orange juice to a boil. When juice is boiling add the dried blueberries and cranberries, lower the heat to medium high and simmer for one minute. Turn off the heat and let sit for a couple of minutes. Strain the juice from the berries and set the juice and the berries aside to cool. In the bowl of your mixer, combine the butter and sugar and beat on medium speed until smooth, about 2 minutes. Add egg, and beat until well mixed, making sure to scrape the bottom of the bowl at least once. Add the honey, strained orange juice, vanilla extract and orange zest, beating until smooth. Beat in oats, flour, wheat germ, salt, baking powder and soda mixture. Mix until just combined and then add all of the fruit and nuts. Stir until thoroughly mixed. Spread the mixture, pressing down to even it out into the prepared pan, and bake for approximately 30 to 35 minutes, until top is golden brown. Let cool in the pan on a wire rack. When completely cool, using the ends of the paper liner, lift out of the pan and transfer onto a cutting board. Cut bars into desired size and store in an airtight container. *Toasting nuts and seeds will add to the texture and the flavour of your baked goods. You can toast them in a 350ºF oven for about 10 minutes or until they are fragrant, let cool and use as directed. Let me know how you like them, thanks! Thank you! I love having these in my freezer, I just take one out when I’m getting ready in the morning and within 20 minutes, its thawed and ready to eat. Busy parents need to eat too! I tried out those bars and they were a big success. My husband loved them, especially before his morning run.They’re filling yet healthy. Thank you for this excellent recipe!! That’s great, thanks for letting me know. So happy to hear that others are enjoying my recipes! These look very good. Do you think you can add chia or flax seeds? Thanks Alex. I think chia seeds would be a great addition, I would start with a couple of tablespoons and see how you like it. I would also reduce the amount of sunflower or pumpkin seeds by the same amount. I love the look of those bars. My favorite breakfast to go is a peanut butter sandwich! Thanks Fiona! Oh yes, I agree, peanut butter sandwiches are great for breakfast on the go.